The Gates of the Ancient Colour Healing Temples are opening and the Colour Rays are flooding out! This is an 8-week home-study course over the internet. 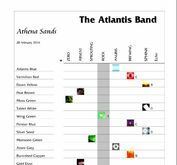 Over those eight weeks we concentrate on one Band of Colours. You meet the 21 Colour Ray Masters of that Band and begin, if you so choose, your lifelong partnership with them. ​People have asked me to please teach over a weekend; but how can you come to deeply know 21 enlightened Masters in one weekend? You cannot! This is not speed dating. The Masters have designed this course, so they can have a genuine opportunity to work deeply with you, if you choose to follow this path. you get a chart which maps your strengths and weaknesses so you can put the spotlight on what gifts you have to share with the world and the stumbling blocks limiting you. 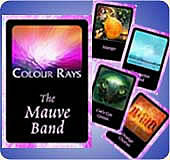 You learn several methods of channeling and how to work with colour divination. You practice sharing your gifts when you are an adept on a Ray and you receive from an adept when you are rocked on another.